Information that enables you to better estimate the duration and complexity of the treatment. The skills to judge the symptoms presented in the case with regard to their peculiarity and to find the distinctive symptoms of the case. A well-structured schedule that can be used to assist you to arrive at a homeopathic prescription, enabling you to choose the right strategy or technique in order to make the correct prescription. 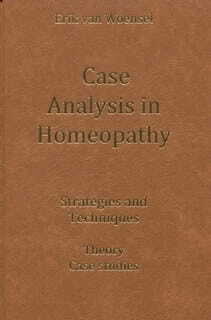 Knowledge as to how to differentiate the appropriate remedies and select the most similar one. Guidelines which enable you to select the right potency with which to start the treatment.